Page 14 - Seeking answers? Join the Tom's Hardware community: where nearly two million members share solutions and discuss the latest tech. They're confirmed for Q1, when Coffee Lake was originally supposed to be launched. Not sure when Ice Lake will be launched, if it's as planned before or also rushed like Coffee Lake. Ok, fair enough. I did not know that or could not remember it. Thanks for the correction. Will those boards support Ice Lake though? (I'm assuming that is the next gen codename; could be wrong). If they won't ,then this gen does qualify as "stop gap". I'm being nit picky about it, but AMD's Llano line was the same deal for me and I've always considered them a "stop gap" as well. I think you guys are 'arguing' over semantics. Stop-Gap does not imply bad chips, or even unplanned chips, but rather a chipset with zero upgrade path. As in, the manufacturer created a product better than the last one, but without plans for future support. IMO anyway. That is also the definition I use. I personally dont care about upgrade path within the same platform. I dont upgrade cpus frequently enough for it to be a concern, and by the time a few years have past I would want a motherboard with the latest features anyway. That is a very reasonable opinion. I was just providing a definition. It is a very valid opinion, but we were discussing "value". Currently, there's absolutely no reason to buy an i3 Covfefe Lake, since the only MoBos available are Z370s. If Intel puts out the H and B MoBos that lower overall platform cost (which Olle P confirms will happen), then value goes up for interested people in good & cheap systems and you can recommend the lower en i3s (and probably upcoming Pentiums?) based on Covfefe Lake to people. 'Sources' have suggested to me that b360 will be a limited OEM release for system builders (dell/lenovo/hp etc) & will only support the lower wattage chips. I'll defer judgement at the moment but will add these sources have been ultra reliable in the past. Well we need H370 at the very least. Amazon has 8600k and 8700k in stock @ 279 and 419 respectively. 8700k didn't have a price listed but order went through, with a delivery date of 14 Nov for both. Hmm, which one to keep? 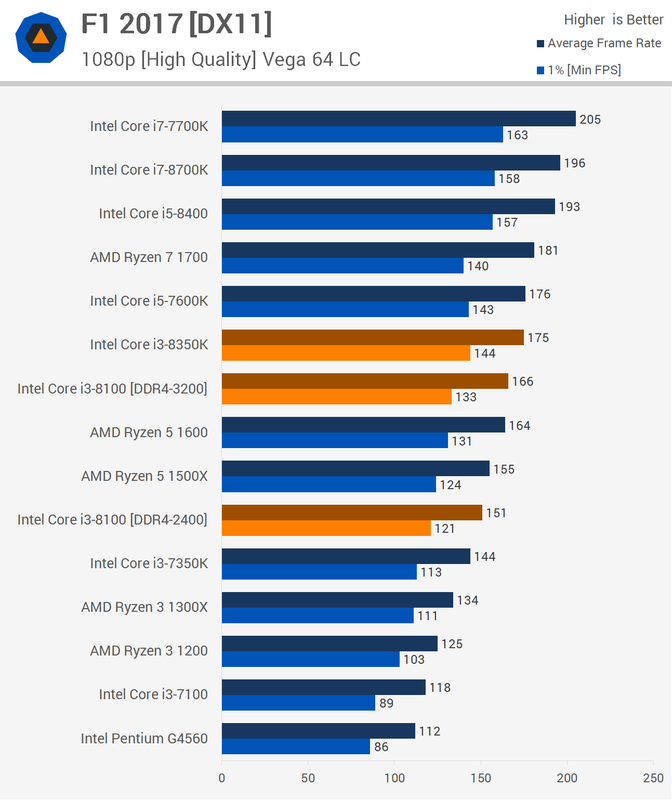 Please somebody talk some sense into me, 8600k right as I only game. Wait, you have a 7700k already?? Why u upgrading at all? Seriously, I just have the bug. LOL keep the 8700k then. If your going that crazy, I like the "Go BIG or go home" idea. Coming from a 7700k, it only makes any kind of sense to go for the 8700k. 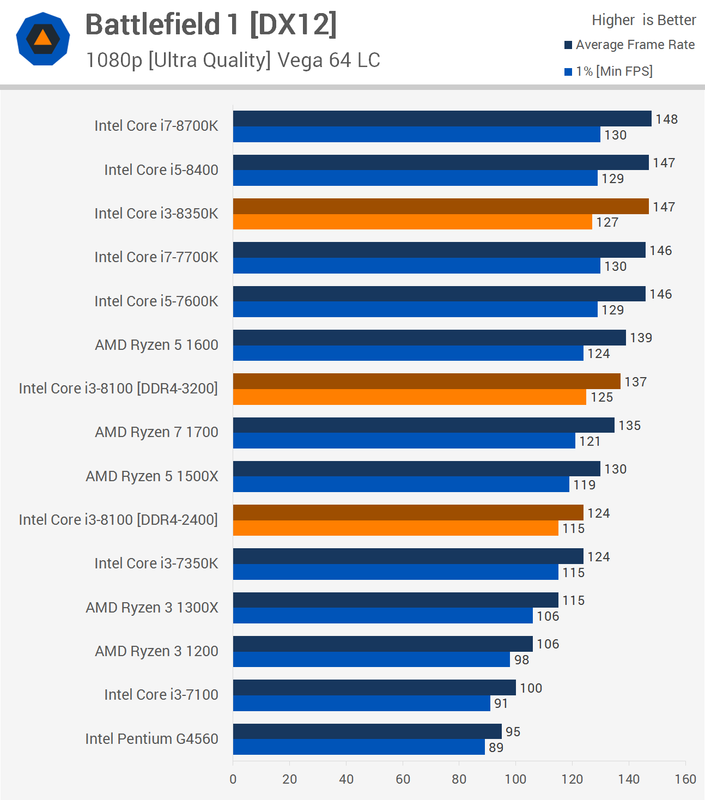 The 8600k isnt a worthy upgrade from the 7700k. Silicon lottery has ETA on 8700k and 8600k of Nov 11. These CPUs are in production and do trickle out to the market. Just don't expect them to be/stay in stock when you want them, until early next year. ^ didn't last long - $137 now. In all fairness still worth the money because it is. Like I said before though a $100 board pushes it well well over $200. 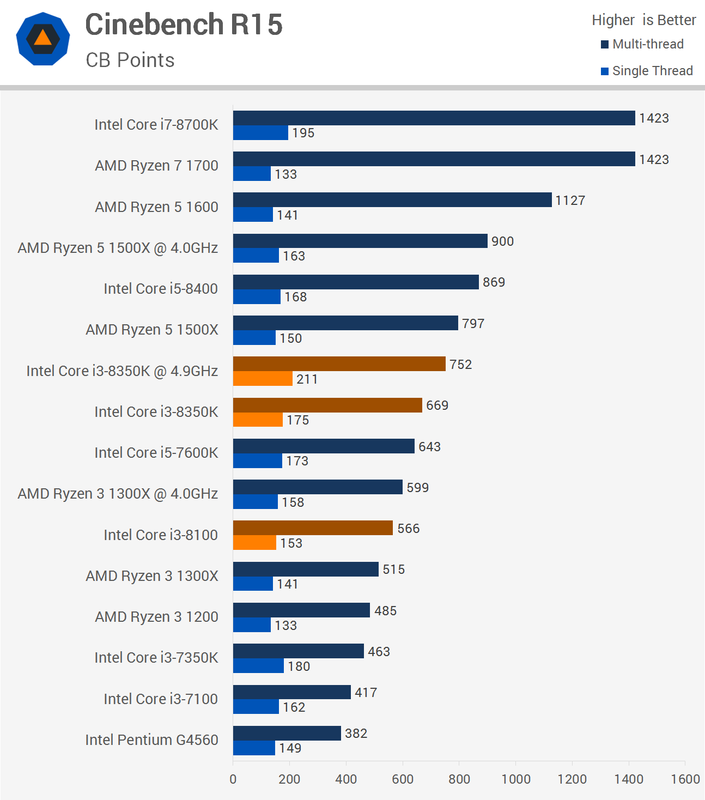 That's my issue , the 8100 is clearly aimed at the lower budget crowd & the board prices kill it when you can get a ryzen 1200,b350 board & for $170 you've got an overclockable setup that in all honesty won't be a million miles behind on performance when it's paired with a budget orientated GPU. For the same money total you've got a 1060 in the build instead of a 1050ti. 60htz screen ?? I'd take a ryzen 1200 & 1060 any day of the week over the 8100 & a 1050ti. Budgets builds are usually playing at 1080p, At that resolution the i3 is massively better than the Rizen 3 due to Intel's better IPC. Well at the end is up to the buyer if they are like you and they don't care that much about the extra performance and the extra FPS, Is up to them if they want to just build the cheapest build possible. But the motherboard prices should be a little less for those budget builds. 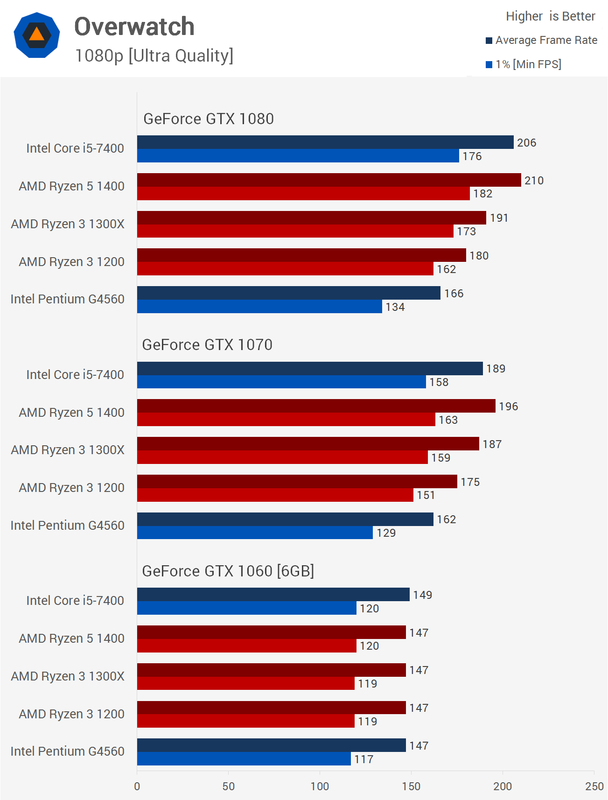 I agree Rizen 3 1200+GTX 1060 is better than i3 8100+GTX 1050 Ti but the Ryzen 3 1200 is less future proof than the i3. At the end is all about you get what you pay for. 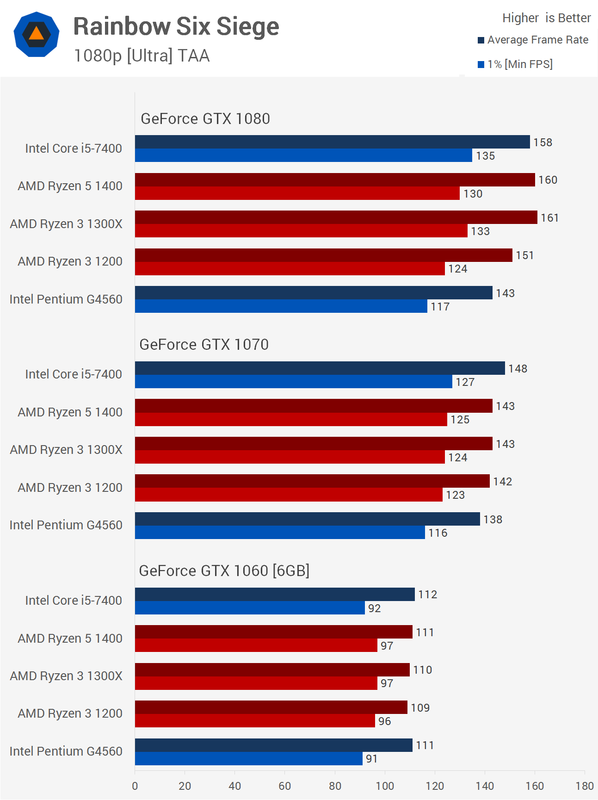 ^ you're still getting over 100fps on the ryzen though on mainstream titles . The promotion must be in hand between Asus & amd & that's going to make up the minds of some people if they're aware of it. He does make some good points in that video that gamers have expressed for about 5 years now! Good video. 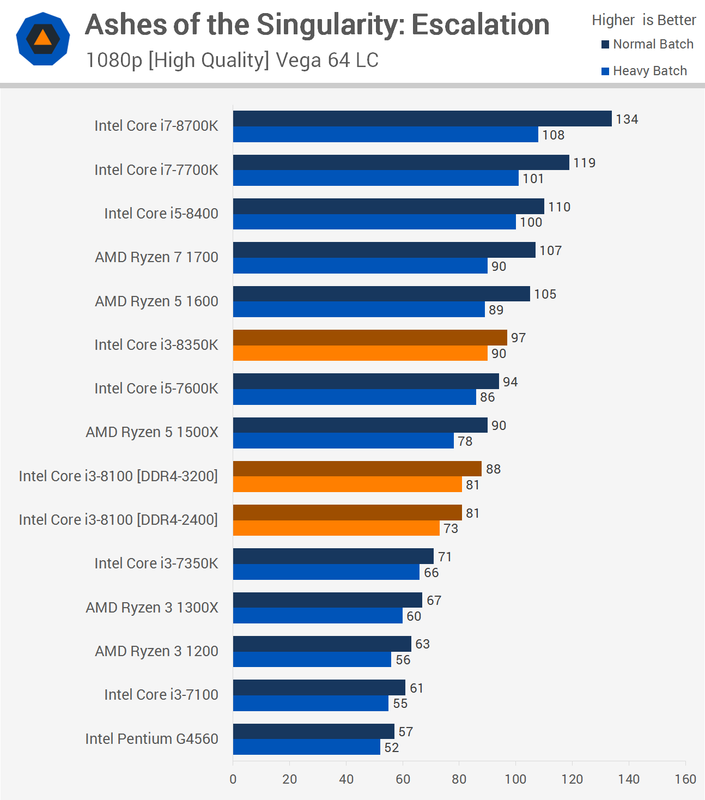 Specially the scaling analysis using Kaby Lake launch data and the 2012 data points. So the, obvious I must say, conclusion is to always test as much as you can to draw the correct conclusions. Just note that you are comparing budget processors for gaming that you should look at budget video cards as well. 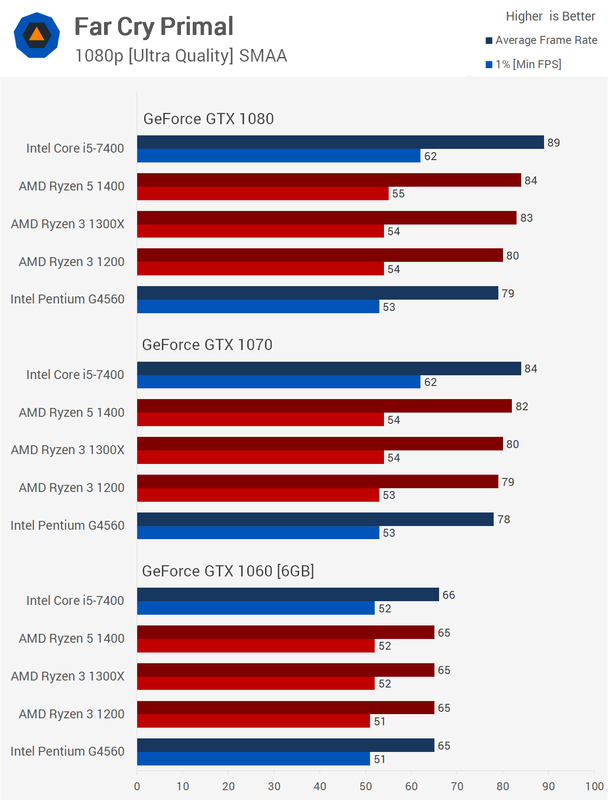 Graphs are using a liquid cooled Vega 64 or 1080Ti will give a skewed impression of what to expect! 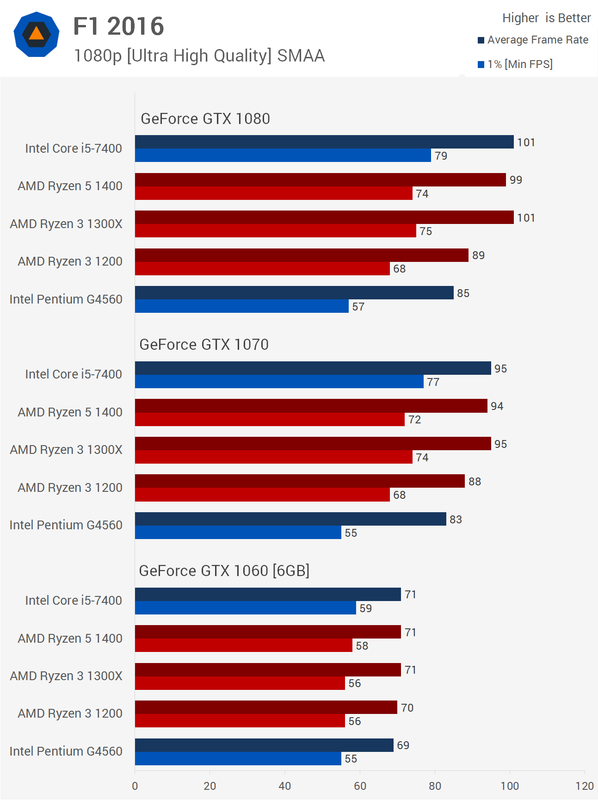 Below is a graph to show you the difference to expect when using less powerful, and more budget oriented gaming cards and processor. 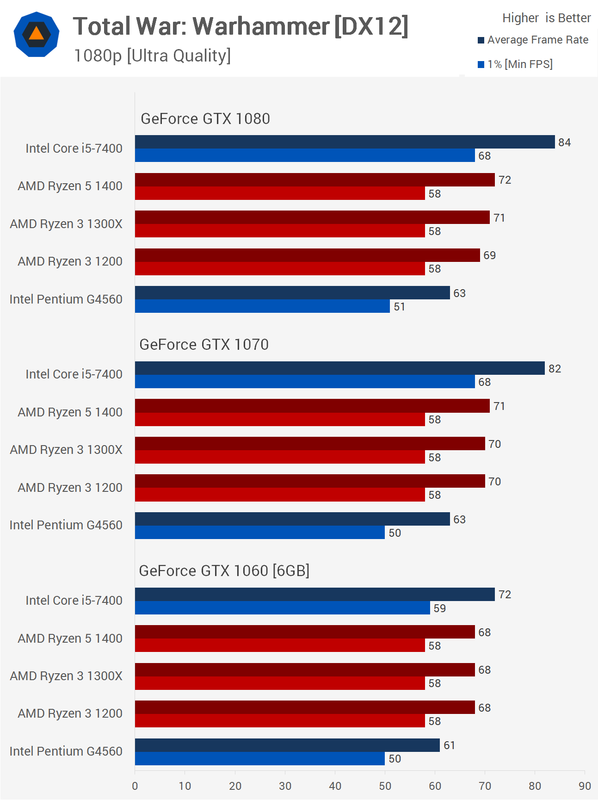 When on a budget going for the processor offering better application performance over gaming FPS numbers is probably always going to be the right answer! 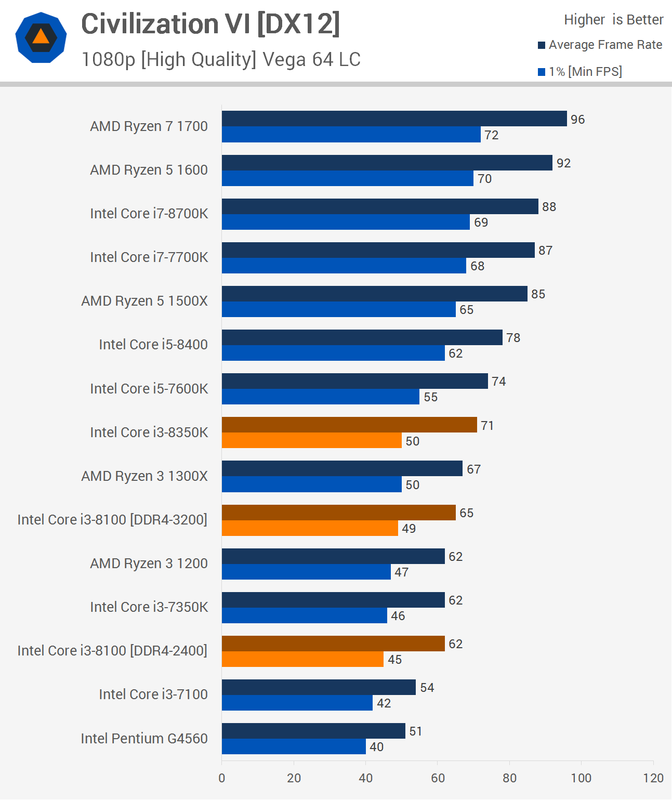 If you're gaming with a graphics card equivalent to the GTX 1060 or slower and you plan on playing newly released titles, then the Ryzen 3 CPUs will be as good as any. 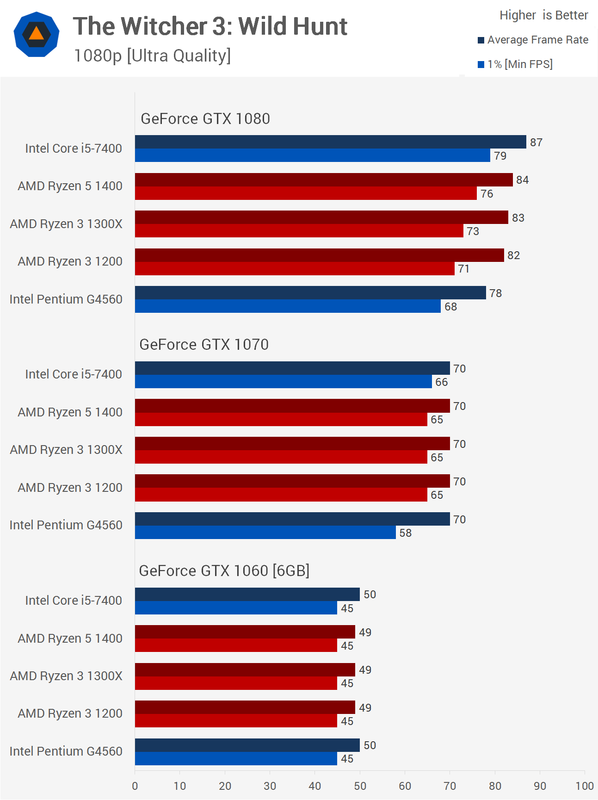 What we've seen here is once you upgrade your GPU in the future or games become more demanding, Ryzen 3 will remain relevant and within reason gamers won't need to upgrade their CPU. 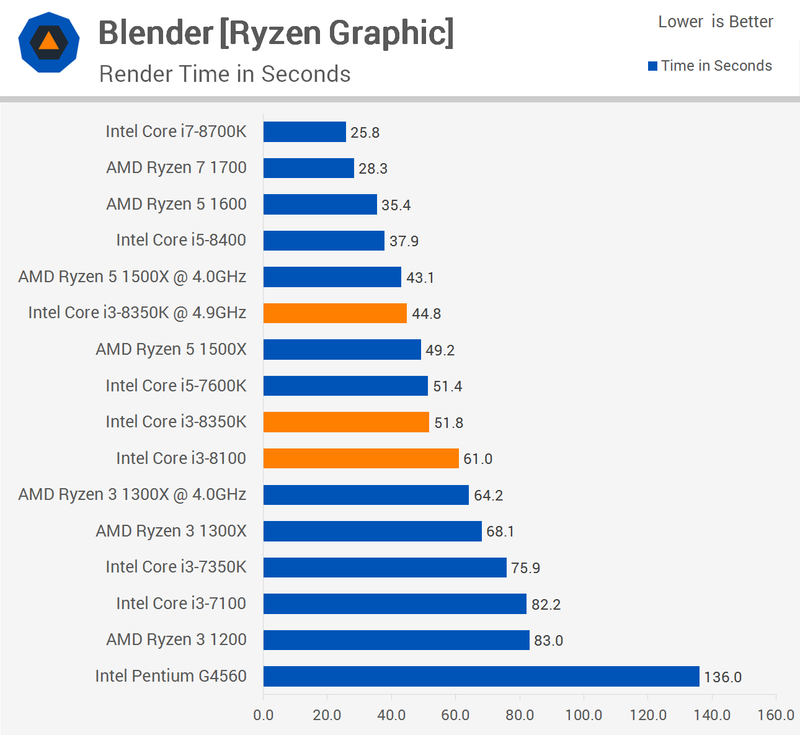 We saw this when moving from the GTX 1060 to the GTX 1070, whereas the G4560 would often see little to no performance gain with the faster GPU, the Ryzen 3 CPUs would. Silicon lottery 8700k 8600k available at 7:00 CST. And top of the chart is taken by new CofeeLake i5s.